6Z31 12:31 Eastleigh - Filton. 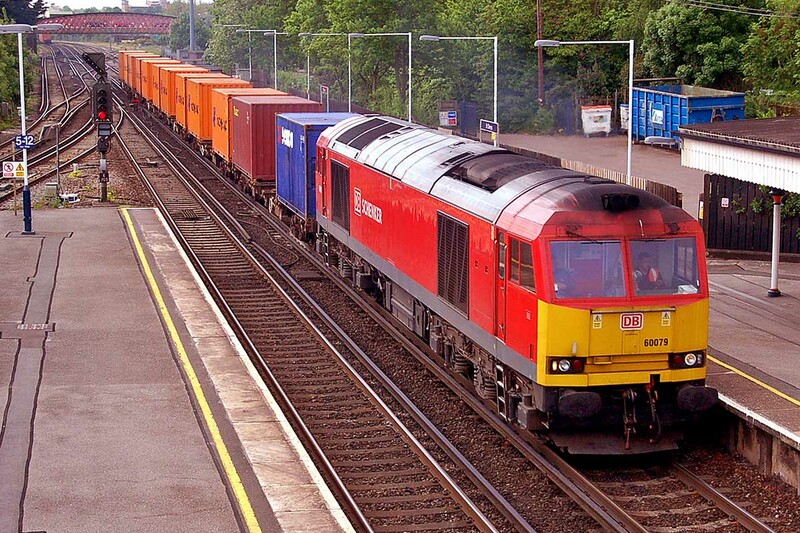 Redbridge. 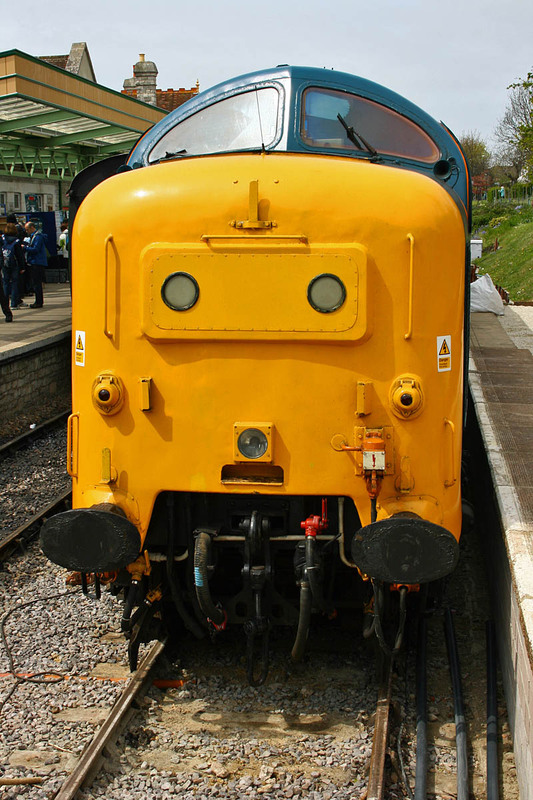 Image by Ian Knight. 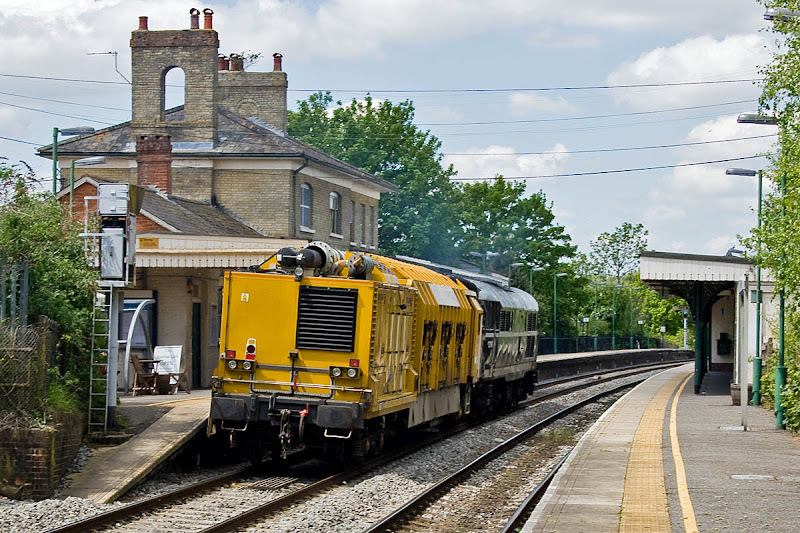 Passing Romsey at 13:00 (with the sun in all the wrong places). 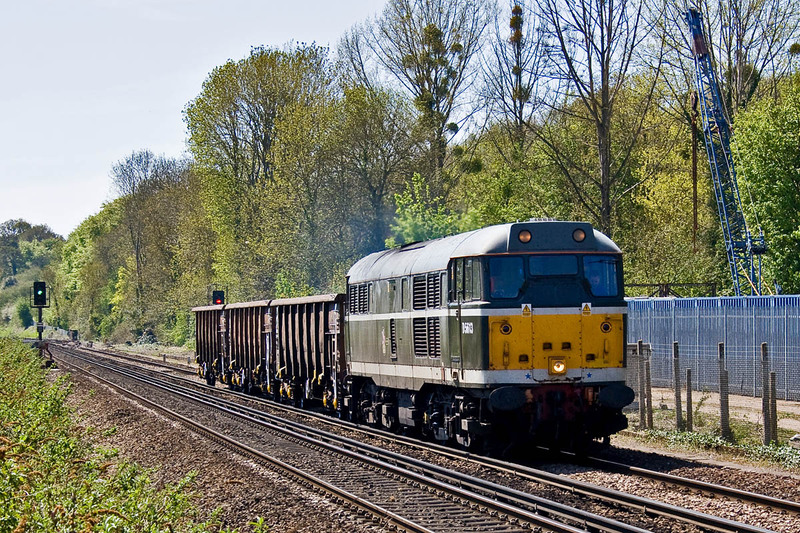 PowerHaul colours on 66504 at Millbrook with 4O59 10:44 Wentloog - Maritime, 18th May. Image by Ian Knight. 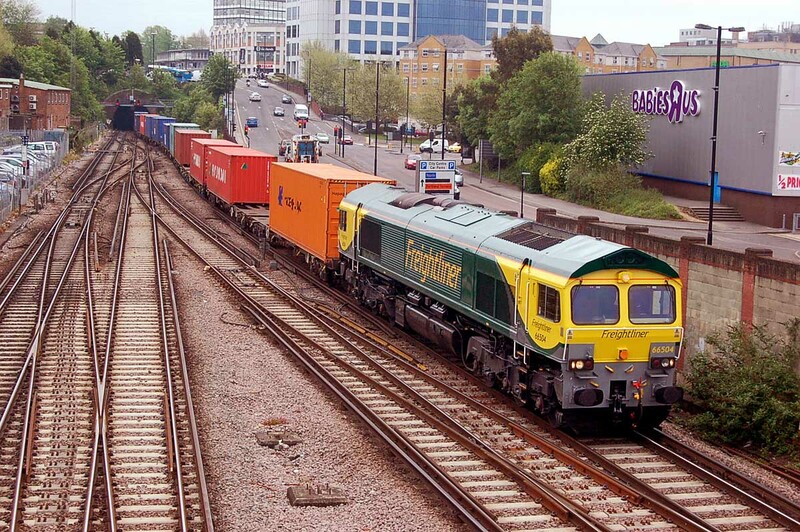 66504 at Southampton with 4O14 07:00 Birch Coppice - Maritime, 21st May Image by Ian Knight. 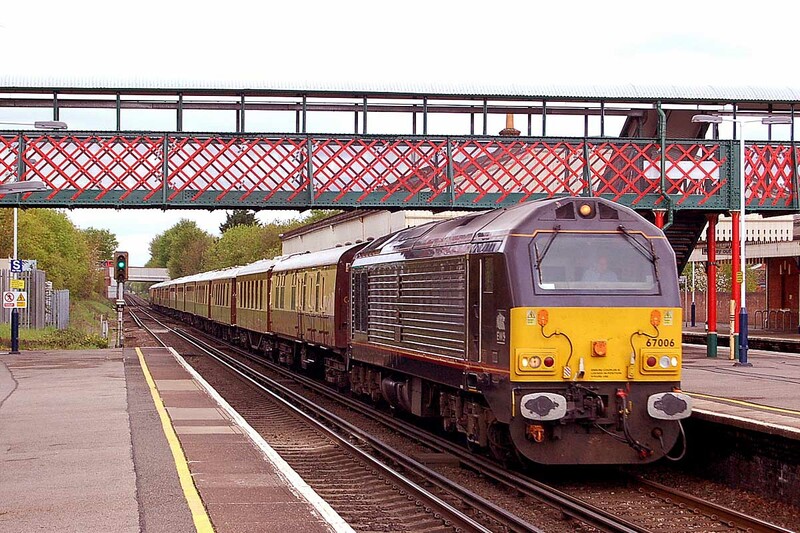 60079 at St Denys, 22nd May. Image by Ian Knight. 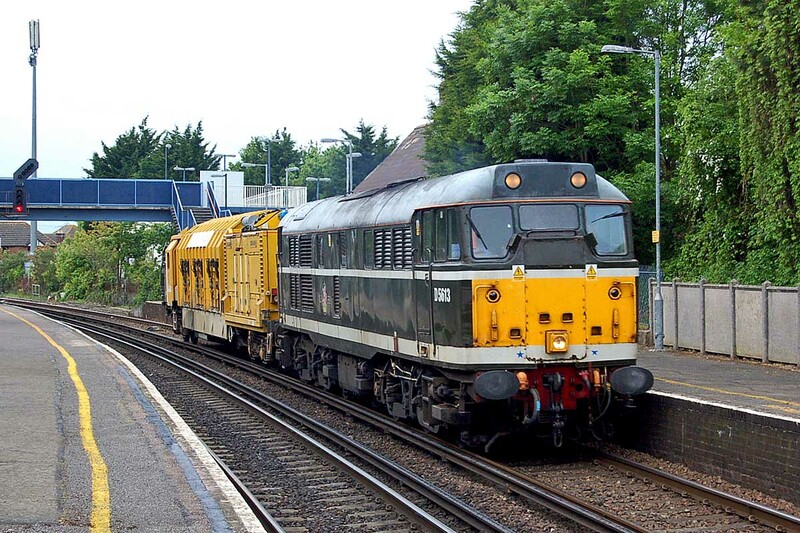 31190 with the RailVac at Redbridge, 24th May. Image by Ian Knight. 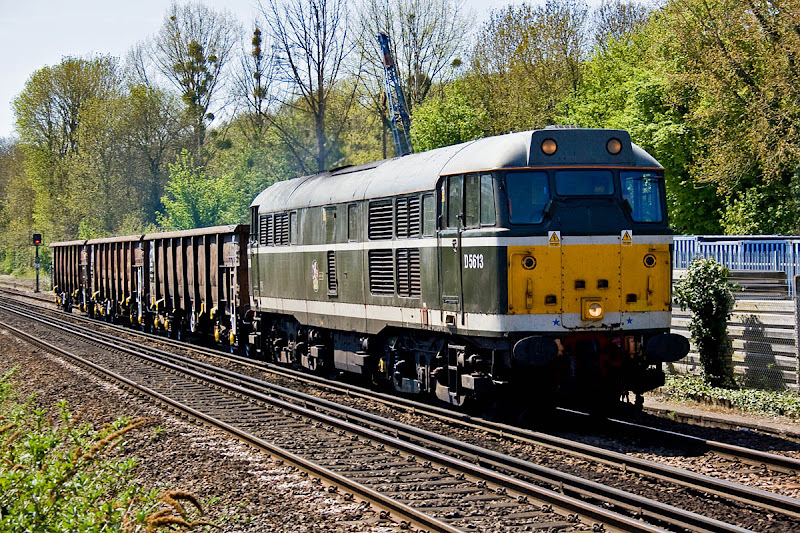 Eastleigh Works gallery updates 7th May, 8th May, 9th May, 10th May including 47839 in a scrap line. 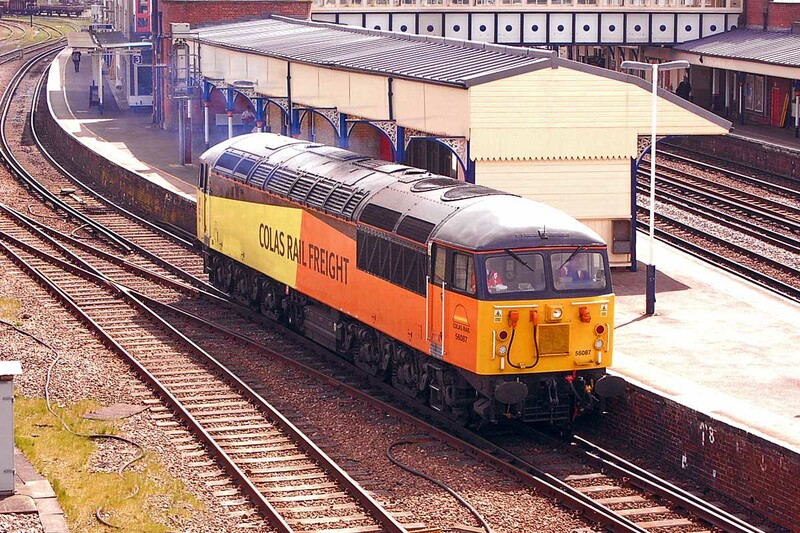 47841 on 22May. 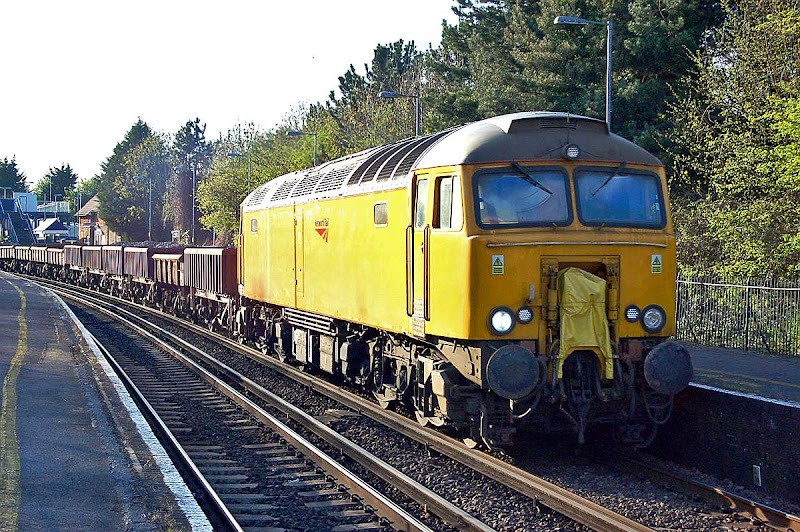 73133 by road from Barry to Western Docks, 20th May (but arrived too late for 56087, which was assigned tow work it forward to Bournemouth). 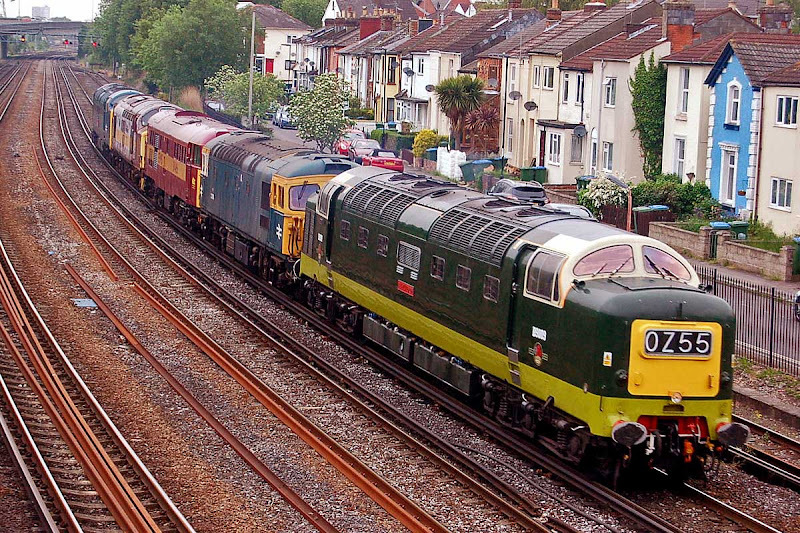 Passing Cliff Road, Southampton. Image by Ian Knight. 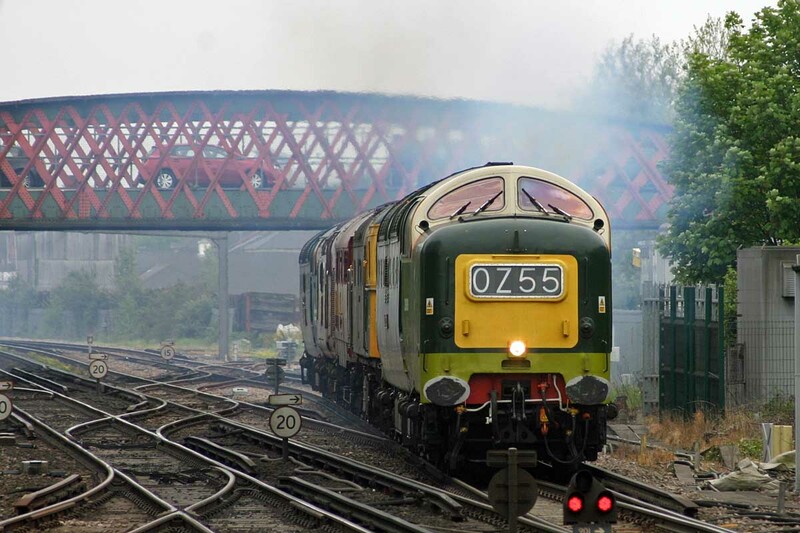 Approaching St Denys passing under Horseshoe Bridge. Image by The Image Team. Passing through St Denys. Image by The Image Team. 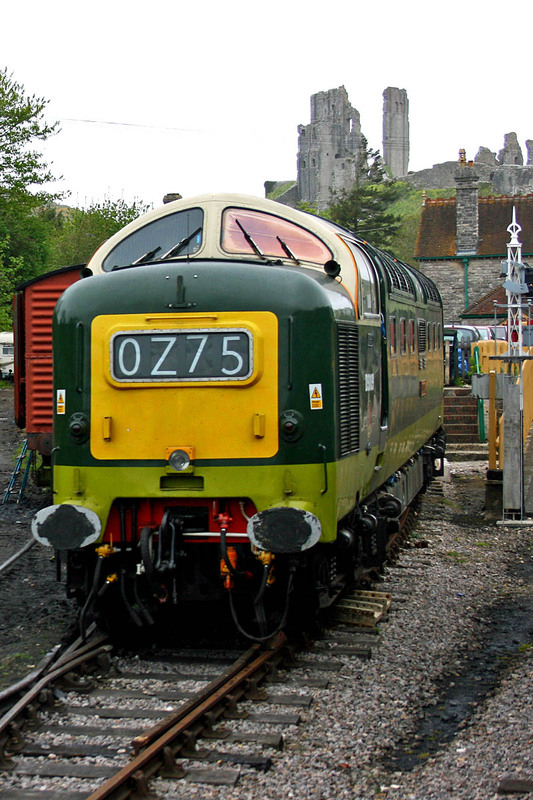 D9009 (55009) Alycidon in the siding at Corfe Castle. 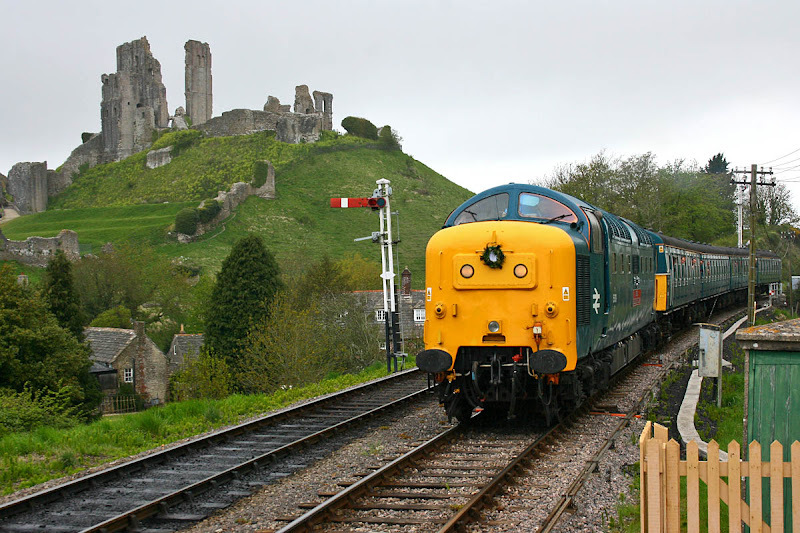 55019 Royal Highland Fusilier arrives at Corfe Castle from Norden, carrying a commemorative wreath. 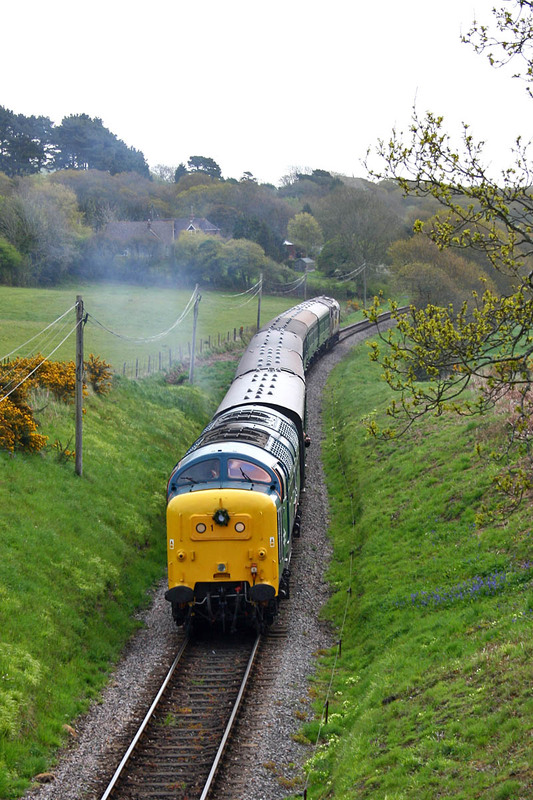 55019 approaches Norden from Swanage. 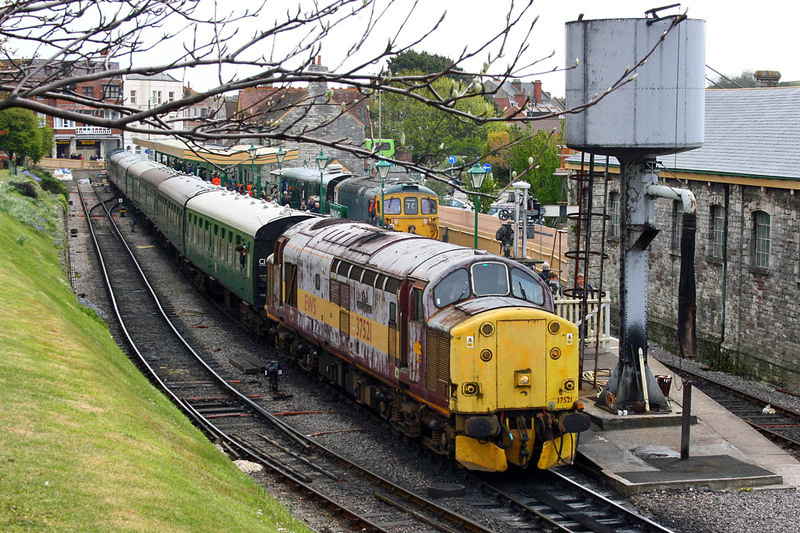 55019 departs Swanage at 13:00. 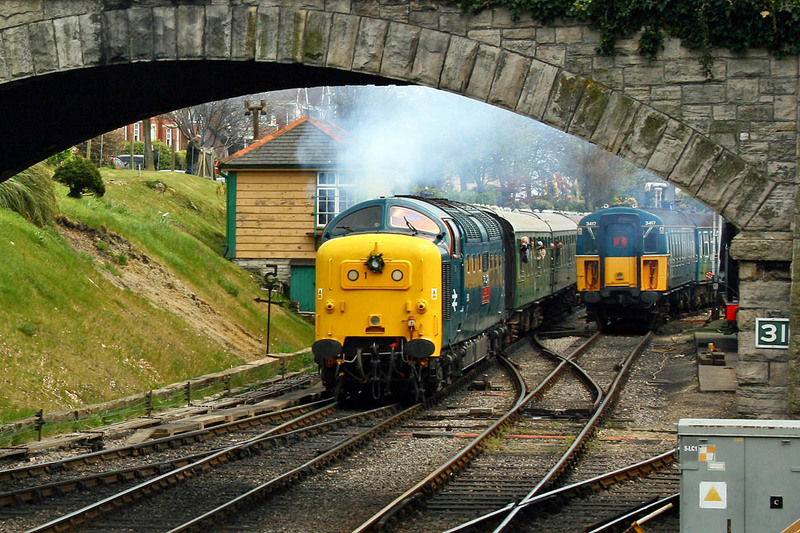 55019 between turns at Swanage. 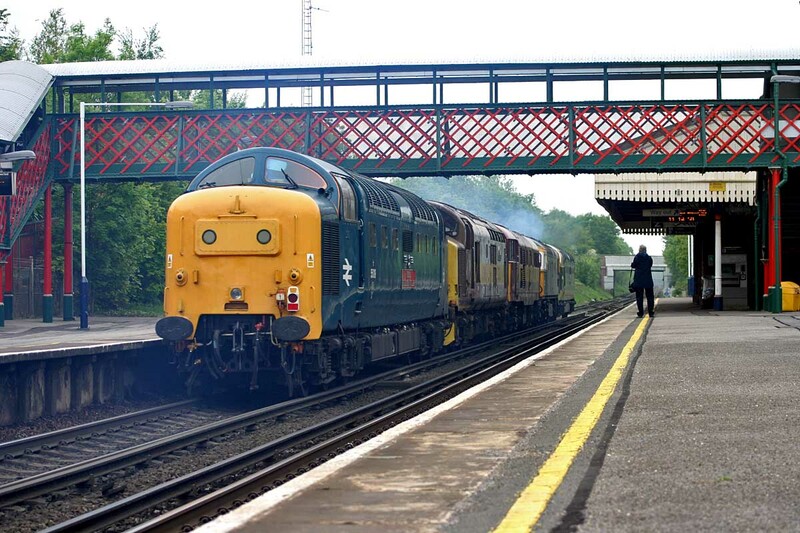 20227 + 20189 + 20142 +3142 on 14th May at St Denys. Image by Ian Knight. 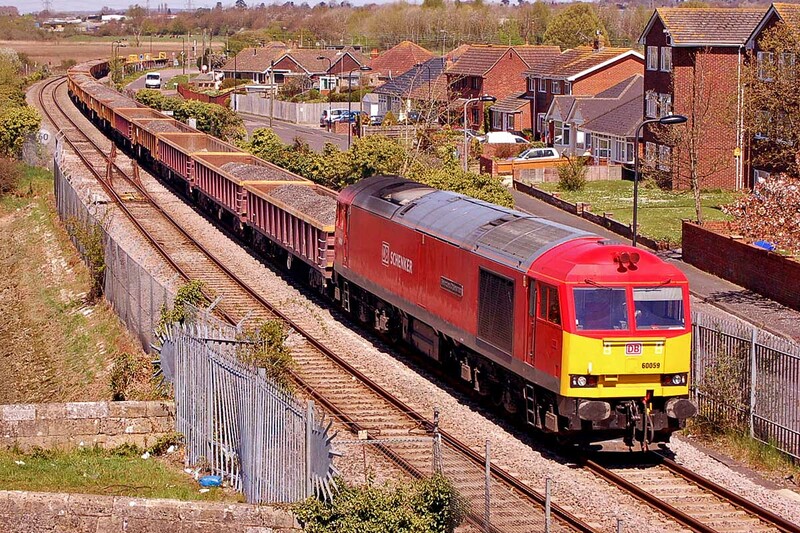 20142 + 20189 + 20227 passing Millbrook, heading for Swanage, 7th May. Images by Ian Knight. 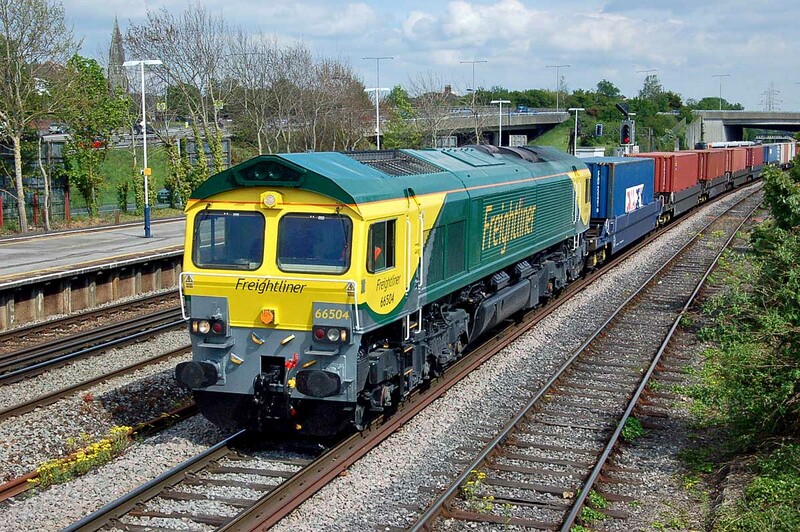 67006 with the VSOE at St Denys, 8th May. Image by Ian Knight. 37521 English China Clays at Swanage. 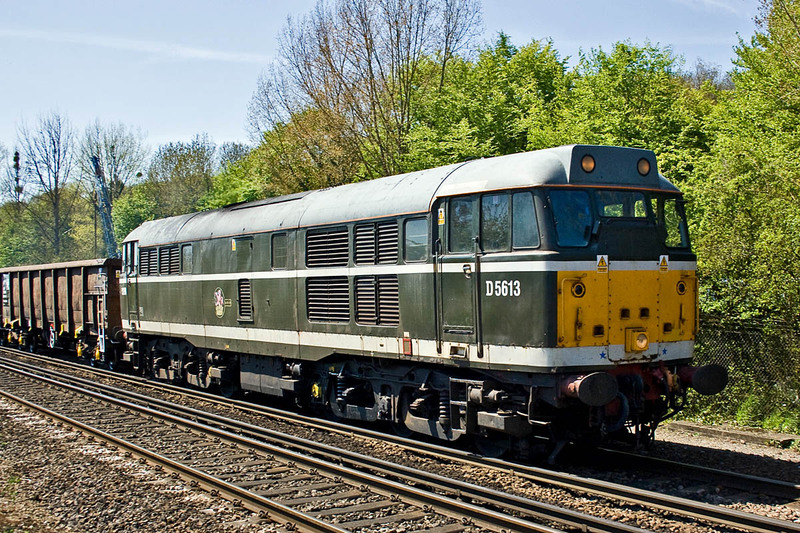 37521 is owned by Harry Needle Railroad Company, at Barrow Hill, and this trip to Swanage saw its first usage under this ownership. The locomotive was new from Vulcan Foundry as D6817 to 41A Sheffield Tinsley in March 1963, later became 37117 and was rebuilt to 37521 in April 1988. 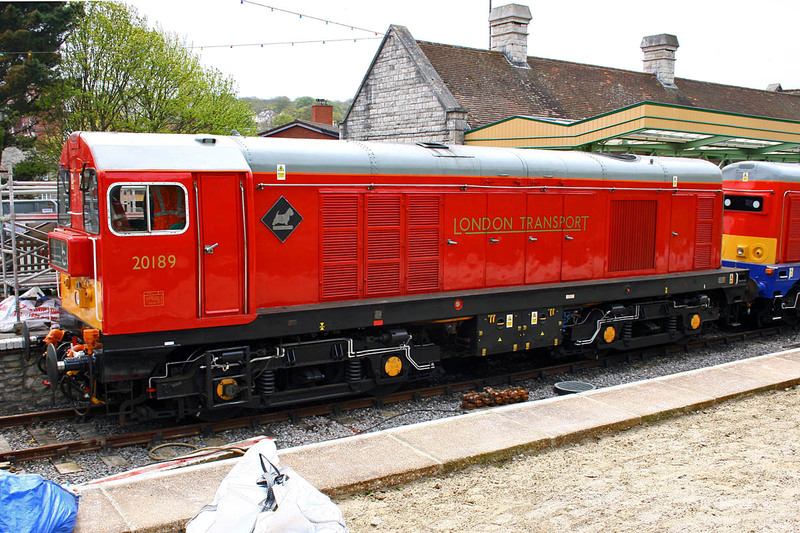 20189, seen at Swanage, was new as D8189 from Vulcan Foundry in January 1967, allocated to D16 Nottingham Division. 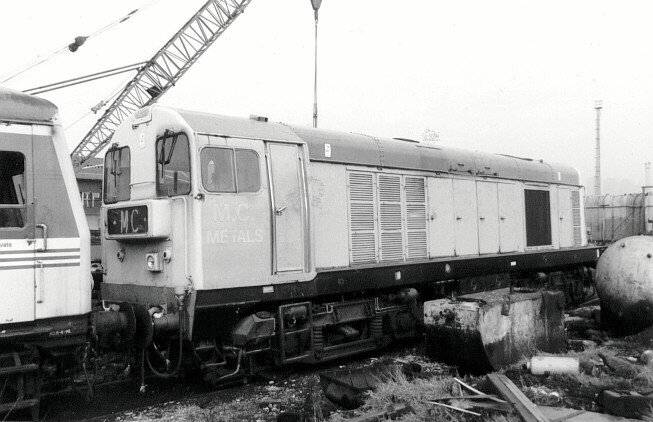 Withdrawn by BR in September 1990, and became the selected shunter at MC Metals scrapyard in Glasgow, later working at the construction of the Channel Tunnel. 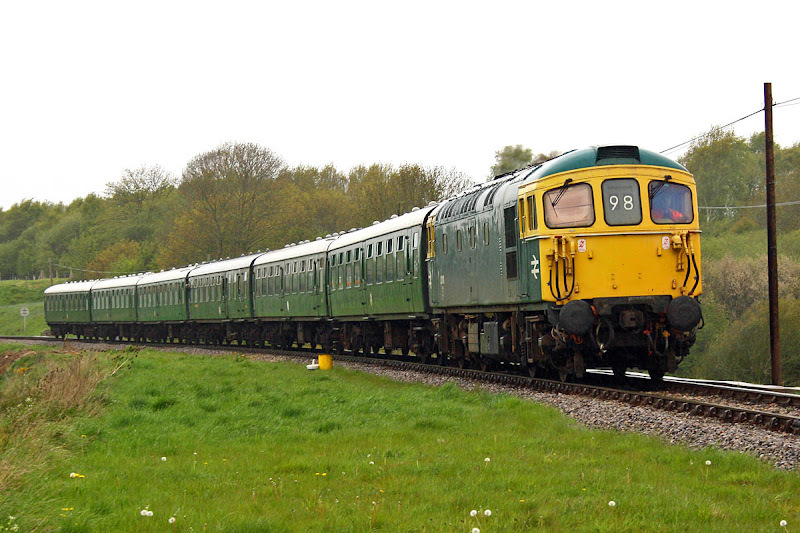 33111 departing Norden. 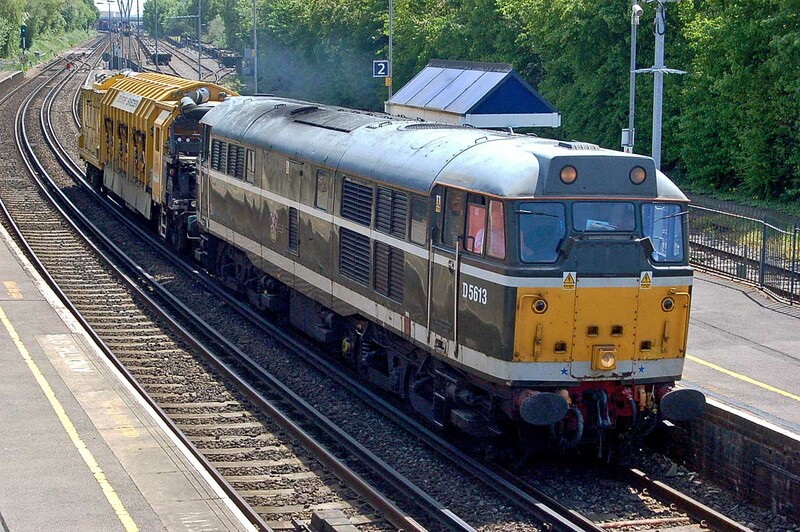 This locomotive was new to 73C Hither Green from BRCW in October 1960 as D6528 to, and was withdrawn by BR in June 1991. 31466 was new from Brush as D5533 in June 1959, allocated to 32A Norwich. Later renumbered 31115, and rebuilt with ETH to 31466. 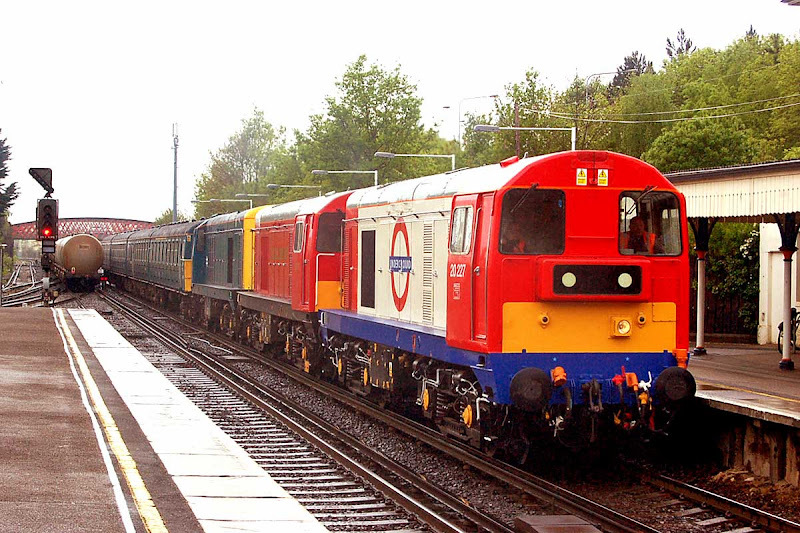 The only Class 31 repainted into EWS colours, it was withdrawn in 2001. 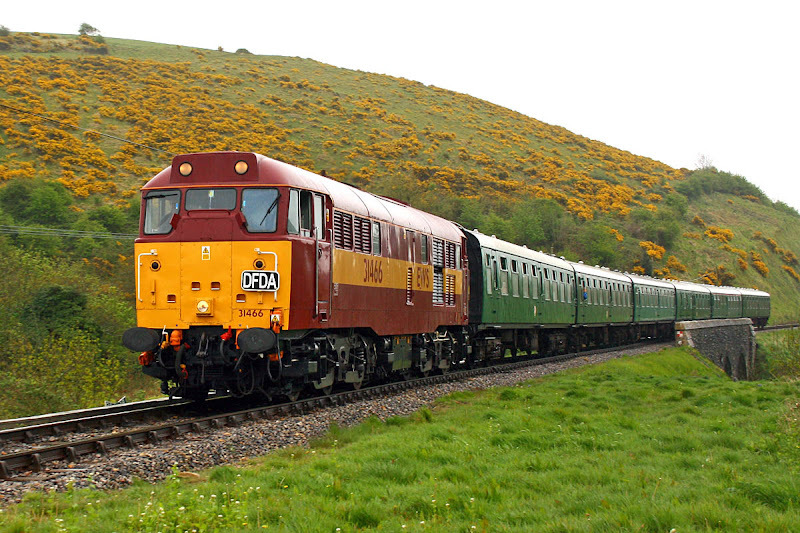 20227 was new at D8327 in February 1968, as the last of the class, and allocated to 66A Polmadie. 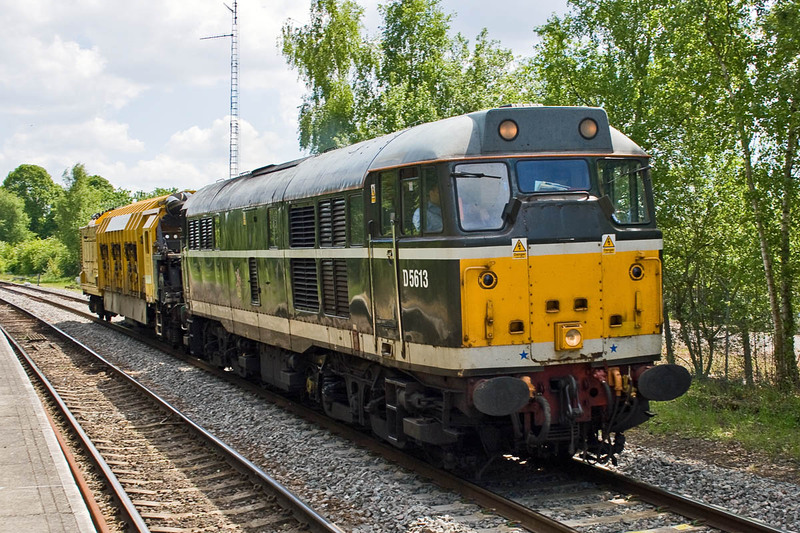 Later seen on merry-go-round coal trains in central Scotland when allocated to HA. 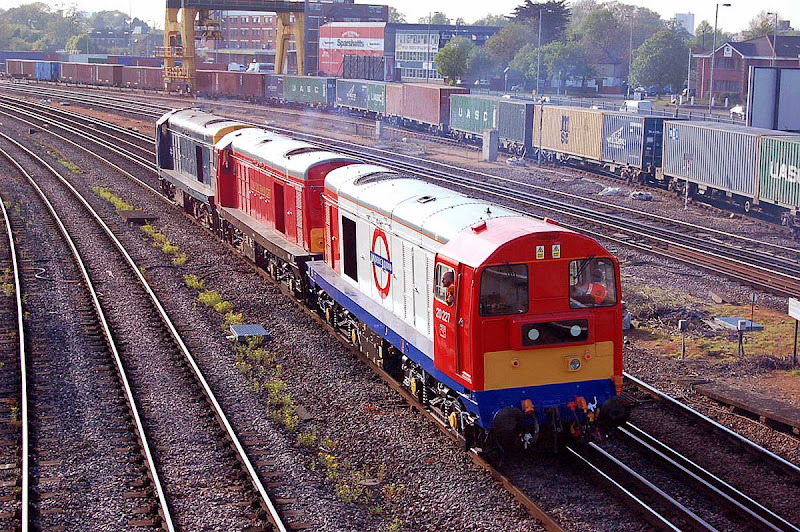 Withdrawn by BR in October 1990. 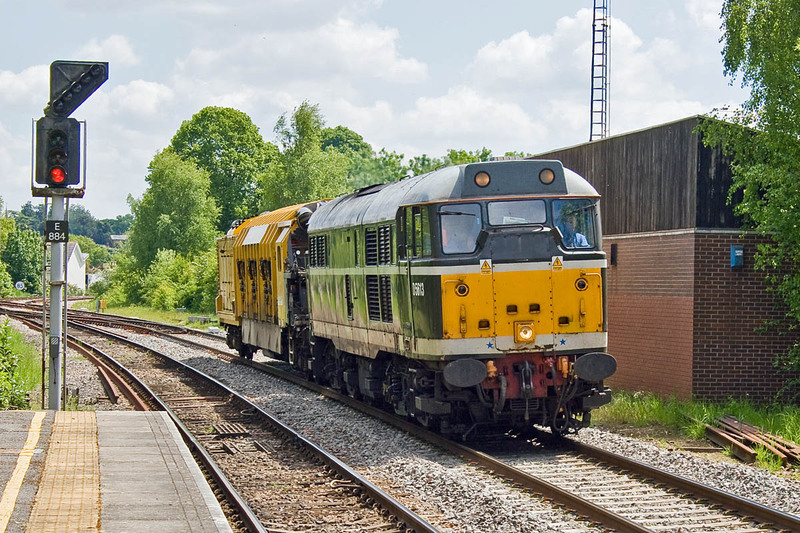 BARS / Devon & Cornwall Railways 31190 on 6Z31 11:52 Eastleigh - Chaddesden, passing Shawford. 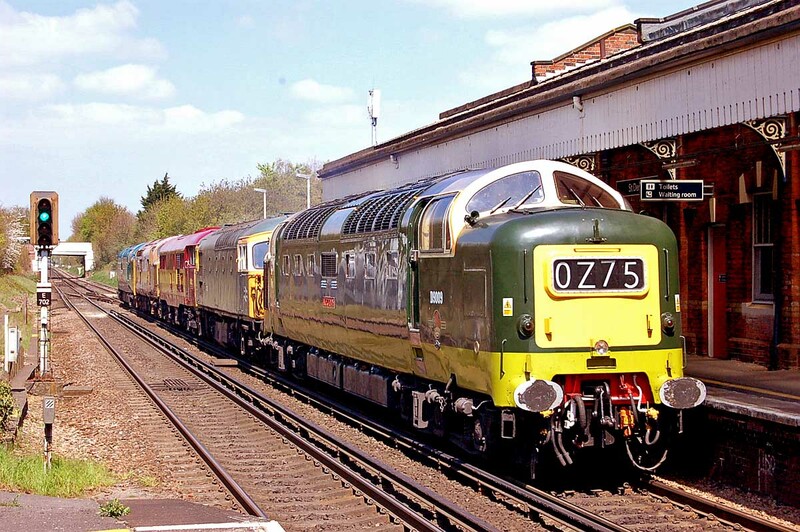 As D5613 the locomotive was new in May 1960 to 34G Finsbury Park, arriving there alongside the Deltics. 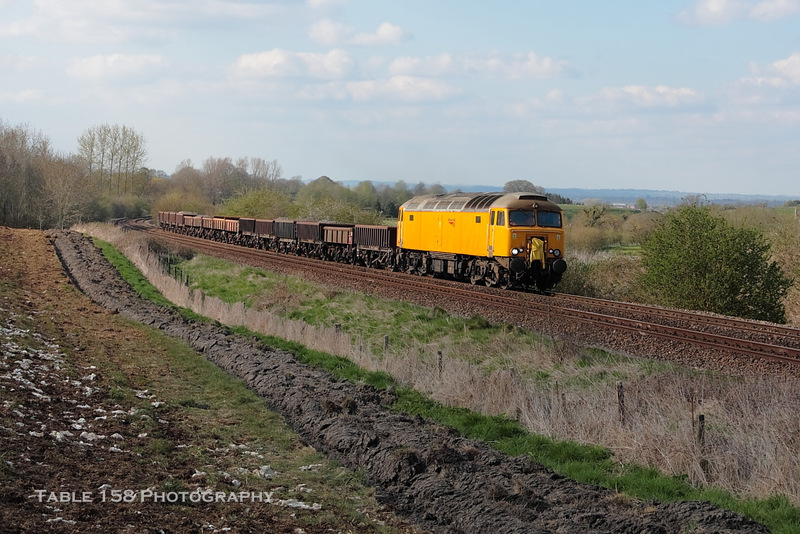 60059 Swinden Dalesman makes its approach to Redbridge with 6O41, 30th April. 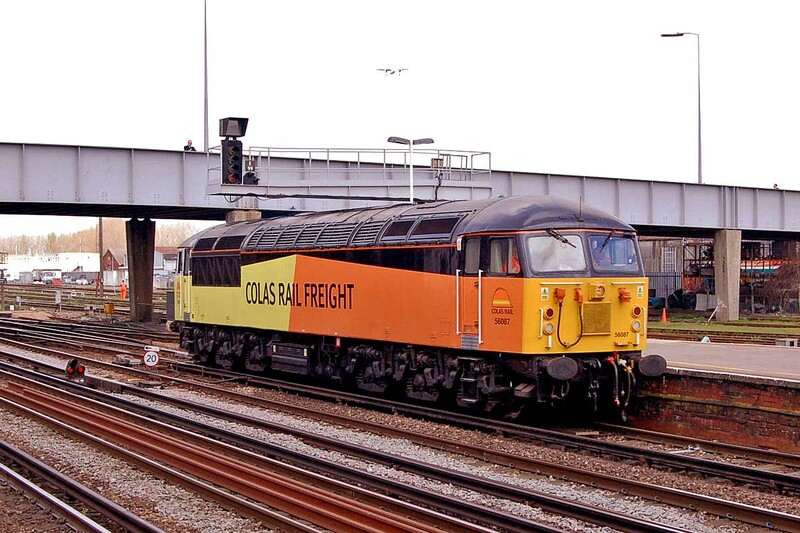 Image by Ian Knight. 57305 at Redbridge with 6Z30 on 30th April. 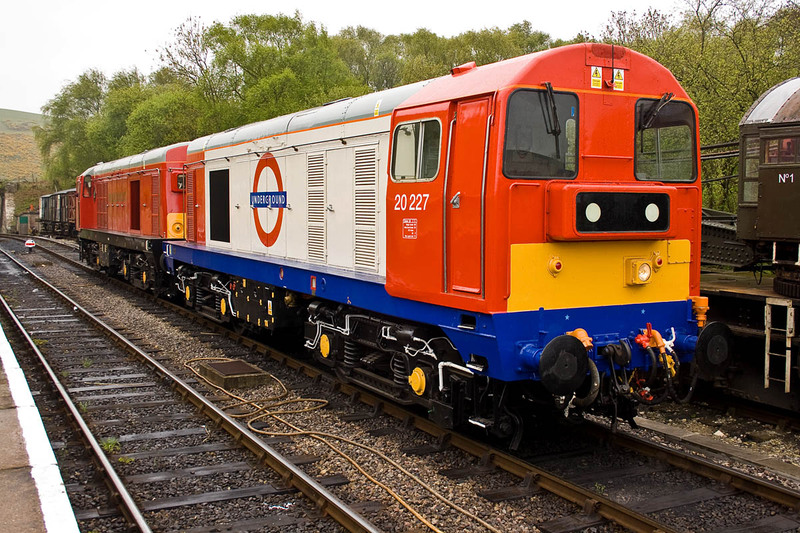 Image by Ian Knight. 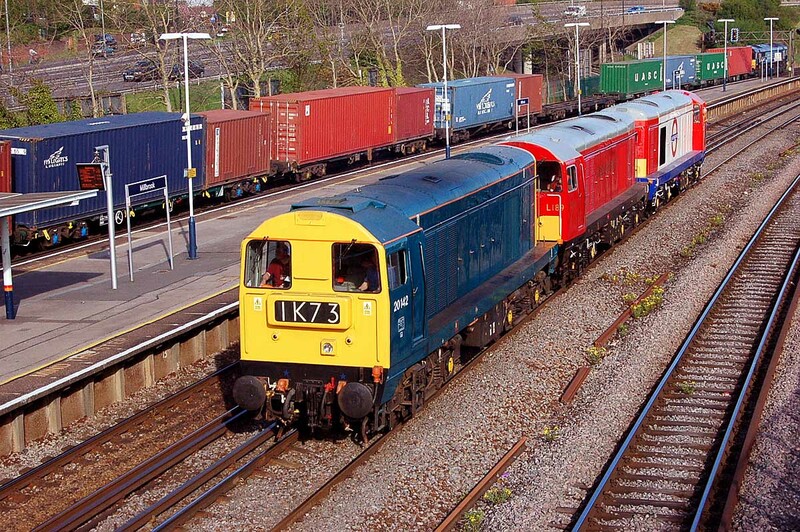 The Lydney - Swanage convoy, at St Denys, 3rd May. Image by Ian Knight.